Whose idea, if not Apple’s, could it be to charge for the update of an Apple product? 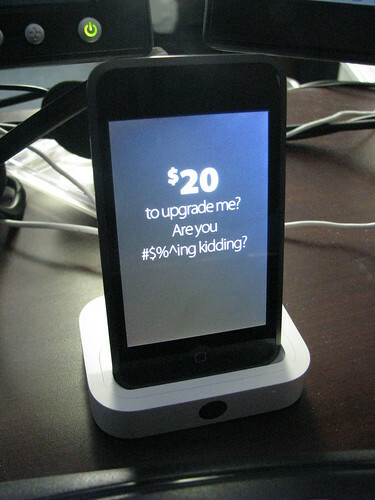 I bought my iPod Touch a bit more than a week ago, which means I bought it in January this year, and now they want me to pay 20 bucks for a “January 2008” update, which everybody else will get for free who buys the box today. That’s a great way to hunt customers away, but Apple’s always been like that. AT of course. They have a vested interest in the iPhone and would probably love nothing more than to see the iPod touch shrivel up and die. AT&T of course. They have a vested interest in the iPhone and would probably love nothing more than to see the iPod touch shrivel up and die. the one from Steve Jobs? Yeah. I don’t ever use it.